The Peddie School is a college preparatory school for boys where Christian influences prevail and where the development of character is placed above all other considerations. To this end every exercise of the School has for its aim the cultivation of those habits of self-reliance and self-control which are essential to a well-rounded manhood. All the activities of a boy's life, -- physical, intellectual, sesthetic, social, moral and religious, -- are carefully directed toward the accomplishment of this purpose. As an endowed academy Peddie offers superior advantages, and spends upon its work all its income from endowment and from students. This policy removes from the administration the temptation to retain students solely for the revenue they bring and makes the School exclusive, not on the basis of wealth or position, but because of its high moral and intellectual standards. It seeks, therefore, only boys of fine ideals and earnest purpose, and cannot retain those whose conduct and habits of study are harmful. The Peddie School is in the borough of Hightstown, New Jersey, an attractive village of about 2800 inhabitants, in the midst of an extensive farming country. 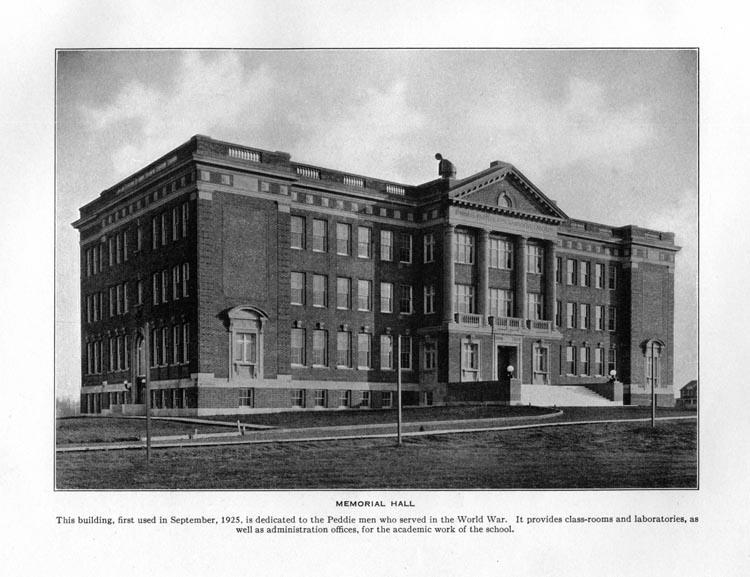 The School is five minutes' walk from the station of the Camden and Amboy branch of the Pennsylvania Railroad, which runs between New York and Philadelphia. It is forty-one miles from Philadelphia, forty-nine from New York, nine miles from Princeton and fourteen from Trenton. The campus contains sixty acres of land, all of which is used for school purposes. In the rear of the buildings is a fine sheet of water, attractive for boating and skating. The playing fields lie to the east of Memorial Hall, and provide four baseball diamonds, four football gridirons, twenty tennis courts, a quarter-mile cinder track, a two-hundred-twenty-yard straightaway, with jumping pits, and space for other track and field events. This new fireproof building, opened for use in September, 1925, is the largest unit of "The Greater Peddie" of which Coleman House, erected in 1912, was the beginning. It is located on the East side of the quadrangle between Trask House and the Roberson Infirmary. It contains twenty-eight class-rooms, laboratories for science, study-room, reception room and offices, with provision for the later addition of an auditorium. A feature of the building is the large foyer which opens out of the front vestibule. The vaulted ceiling of this foyer is supported by marble columns and pilasters. The walls are paneled in French Caen stone, above which is a mural frieze which forms a band of color as a foil to the colder stone surface below. At the rear of the foyer is an imposing memorial tablet of bronze, bearing the names of the more than six hundred Peddie men who served in the World War. 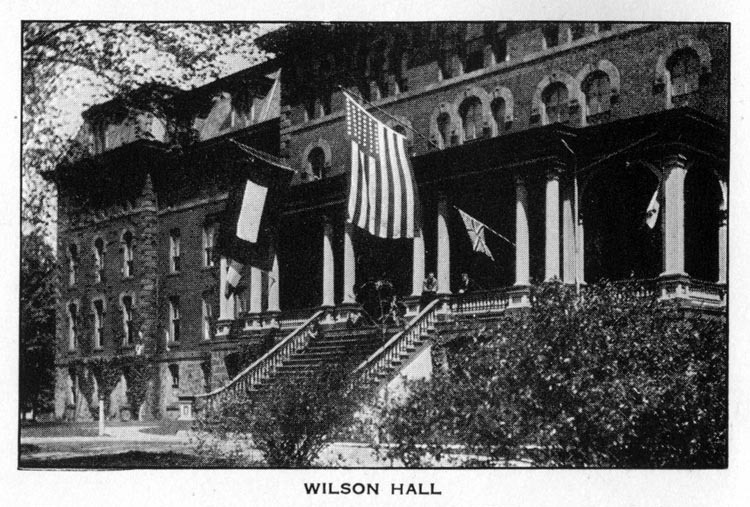 This large hall, named in honor of the late President of the Board of Corporators, William V. Wilson, D.D., was erected in 1866, and is built of brick, with brown-stone trimmings. It has been modernized in recent years and is kept in excellent condition. Like all other Peddie buildings, it is heated by steam (from a central plant located at a distance from all dormitories), is lighted by electricity and supplied with an abundance of pure water from artesian wells. This building is used almost entirely as a dormitory and accommodates about two hundred boys and ten teachers. All the rooms are well lighted, comfortable, home-like, and properly cared for. With few exceptions, each room is planned for two boys and is furnished with two single iron beds, mattresses, two chiffoniers, a study table and plain chairs. Boys furnish pillows, all bedding, easy chairs, rugs, sofa pillows, pictures, pennants, etc. Each boy has a closet with shelves and drawers for his clothing. Trunks are not desirable in the room, though a small steamer trunk may be kept under the bed. 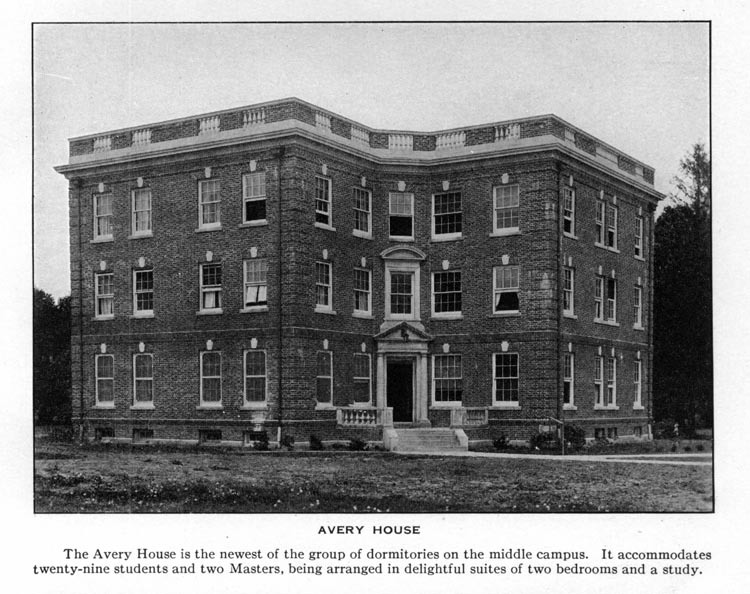 The third of the series of new dormitories was erected in 1920. It is a companion to the Coleman House and stands in the rear of the Longstreet Library on the northwest corner of the quadrangle. The architecture, construction, and arrangement of rooms is the same as the Coleman House. It is named in honor of the late Rev. E. J. Avery, Principal of the school from 1876 to 1882. 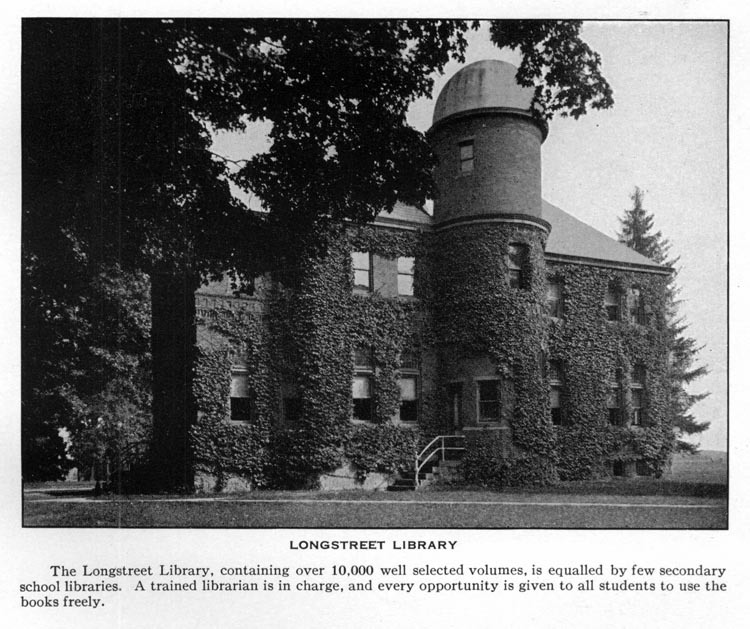 This beautiful structure was erected by the late Mr. Jonathan Longstreet and his sister, Miss Mary A. Longstreet, of Holmdel, New Jersey. It is two stories high, built of brick, and finished in the interior in natural woods. The library contains more than 10,000 volumes, classified according to the Dewey decimal system. Daily papers and a carefully selected list of current periodicals add to the attractiveness and usefulness of the reading-room. A trained librarian and her assistant keep the library open from 8 A. M. to 8 P. M. and devote their time and efforts to making it of practical value to every boy. Classes in library practice are conducted regularly and interest aroused in this valuable adjunct to school life is indicated by a voluntary daily attendance averaging above fifty students. 1. "The School," The Chronicle of The Peddie School, Vol. LXIII, No. 4, May, 1928, pages 10-18.